Since the presale stared what would be better Carrack or the Corsair? The Carrack is the top-tier of exploration ships while the Corsair is more of a competitor to the Constellation. In terms of price and size it sits inbetween the Freelancer DUR and the Constellation Andromeda. The Corsair seems to be a significant upgrade from a Freelancer DUR and is a contender as a budget Aquila, however, it's not even in the same league as a Carrack -- nor should it be. The problem I have with the Corsair is that it seems to be marketed as a legit Exploration ship, whereas typically Drake ships give a wink and a nod to more nefarious purposes. Yes, the Corsair is heavily armed, which strongly suggests that it can be used in a combat role, but having detected any hints from CIG what it's really for. Is the Corsair supposed to be a Pirate Leader's ship? For example, if there's a small-to-medium size Pirate Org of ~30 players, with more than a dozen starfighters (Buccaneers), a few combat-transports (Cutlasses), and a loot hauler (Caterpillar); is the Corsair the pirate command ship? A Pirate Org of that size probably couldn't afford a Kraken or other cap ship, but they'd need a medium-size ship (or large) for their leader to oversee a raid op while his/her crew operates the ship. However, there's no mention of the Corsair featuring sophisticated sensors or comms, or even a tactical map station, which would be useful for combat coordination. So it doesn't seem like the Corsair is a viable command ship. The Corsair seems like it has formidable offensive and defensive capabilities, but based on my experiences flying the Connie in combat, medium and larger size ships are easily overwhelmed by starfighters, especially when outnumbered (and gun turret improvements still haven't been implemented by CIG). Therefore, I don't think the Corsair will be effective as a solo pirate ship, unless it's preying a solo transport, like a Freelancer or Starfarer. However, if the target has fighter escorts -- or first-responders arrived -- the Corsair probably won't be successful. However..... like the Constellations - the Cosair won't fit through Small Jump Points + the DUR is likely to have the longest range of any ship (even longer than the Carrack) - from what CIG has mentioned before. The Cosair however has the Rover and probably a better scanning suite. it's not even in the same league as a Carrack -- nor should it be. Agreed - the Carrack is the Penultimate Mapping ship (not necessarily Penultimate Explorer ship --- like the Endeavor with Telescope Module - they are two different things)....... and all player ships can only be "Penultimate" ships......... with "Ultimate" ships being ONLY reserved for NPC corporations (like Shubin) or the UEEN. yeah, I'm with ya bro. That pic makes a good point about the Corsair's visibility. It seems ridiculous that CIG isn't aware of these design flaws -- or they are, but they don't seem to care. Perhaps CIG believes that restricted visibility is a realistic problem for many aircraft in the present day and especially historically, and they use it for ship balance. For example, Drake ships are unofficial Pirate/Criminal ships and primarily used in combat, but they all seem to suffer from cockpit visibility problems. Perhaps it's intentional to give the cargo haulers they prey on a fighting chance. Whereas "good guy" starfighters, like the Hornet, Sabre, and Gladius, have excellent visibility and therefore have an advantage over Drake combat ships. Also, the moveable co-pilot chair on Drake ships is ridiculously over-engineered. Considering how inexpensive Drake ships are, it's unbelievable they have such an elaborate and presumably expensive hydraulic articulating/telescoping lifting mechanism for the co-pilot seat, just so the pilot and co-pilot can get in and out of their seats without interfering with each other. Considering the size of the Corsair, I don't understand why it doesn't have side-by-side pilot/co-pilot seats, like the Freelancer. A medium-size ship should have a roomy cockpit, not narrow cockpit, like the Cutlass. I would rather the Corsair have a chin-mounted manned gun turret in place of the underslung co-pilot seat, similar to the Ghost from Star Wars Rebels. A gunner's station doesn't need all of the MFDs that a co-pilot has, so the gunner's view would be less obstructed. It would be even better if it was a bubble canopy that extended from the nose for improved visibility. Instead, the Corsair has gun turrets on the sides of its neck, which don't seem like ideal positions. Perhaps those gun turrets can fire forward, but if a frontal target strays slightly to the right or left, one of the turrets won't be able to shoot at it. Whereas a chin turret would have a wide frontal arc and would only require a single gunner -- and might even be controllable by the pilot. It really seems like CIG gave the Corsair deliberate design flaws so it wouldn't be over-powered for its price point. I originally wrote my post on my phone so I didn't have all the pics of the Corsair readily available. 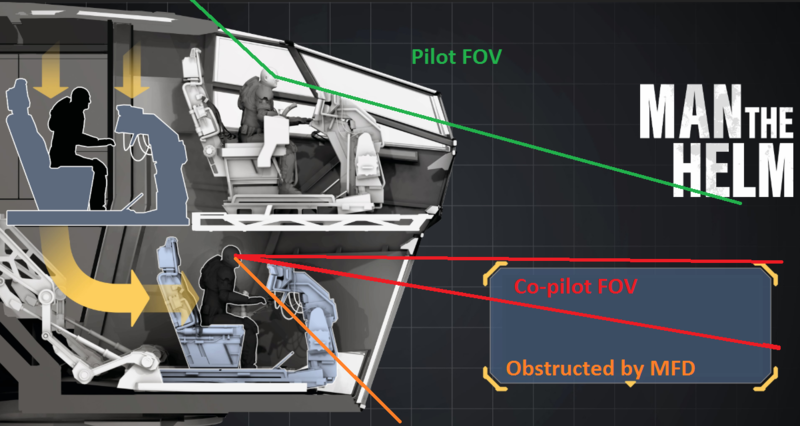 I was replying to VoA's pic of the Corsair's limited cockpit visibility, and relying on my memory of where the Corsair's weapons were positioned. I remembered the side turrets but forgot about the gimballed weapons around the ship's nose. Regardless, I'd prefer a manned bubble turret on the ship's "chin" over the gimballed weapons and the two side gun turrets. I really don't think those side turrets will be very useful, and they're crew intensive. Even if there ended up being fewer guns overall, I think a bubble turret's unmatched visibility and forward firing arcs would be preferable. Heed the call of uncharted space and harness the spirit of exploration with the Drake Corsair, a worthy companion, supporting you in battle, discovery, and delivery, wherever the winds of adventure may steer you. Hi all, I saw this site while browsing for info on Star Citizen. I just joined up to try to trade and am hoping to buy a Drake Dragonfly "Ride Together" 2-Pack with LTI (it contains a yellow and black version of the Dragonfly both with LTI). I am offering $78 USD inc PayPal fees. I am verified on PayPal but a new member here. I would prefer to buy from someone with a trade history here and since I don't have a history am willing to speak on Discord or something to verify myself. I am an original Kickstarter Backer and looking to kit out a Cutlass Black for the PU. Please PM me whatever details I need from you and what you need from me if you have a pack you'll sell for the above price. Many thanks. I have Drake Caterpillar Pirate like this. For sale at $305.